Wader Quest: 16 days to go; with a ditty. 16 days to go; with a ditty. 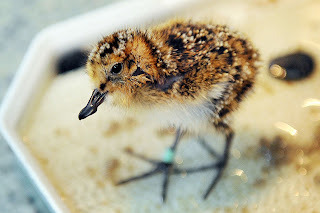 He is a spoon-billed sandpiper, he has a funny beak. He’s delicate and tiny, and relatively weak. He lives in Arctic Russia, and winters up the creek. It is the spoon-billed sandpiper, that we are off to seek. Every day a challenge, just fighting for his life. And last year down in Myanmar, they barbequed his wife! Spoonie, spoonie, what you gonna do? Now that down in Asia there is no room for you? I hear that down in Myanmar they still make spoonie stew! The detectives went to Myanmar, to gather up the facts. They worked their little socks off, pushing to the max. Turned hunters into fishermen, so spoonies could relax. The gang went up to Russia, for spoonies they did look. They looked and looked, then looked some more, and even sleep forsook. They searched in all the crevices, each cranny and each nook. Finally they found a nest, and all four eggs they took! The chicks were hatched in Russia, then to England they did fly. These chicks grew into juveniles so dapper and so spry. But in four walls they languished, with the captive breeding team. The captive breeding programme, was at full head of steam. Meanwhile back in Russia, they were still denuding nests. Hatching eggs and rearing young, free from harm or pests. With vet on hand in case of ill, but they passed all the tests. The project was a huge success, with many lessons learned. The gang could now put up their feet, a cup of tea well earned. No more spoonies in the pot, just smelly fish and stock! Is if you care enough it seems, what you wish can be. And then my great granddaughter, can see one just like me. Now Asia is much safer, a place where you can rest. We hope you have a peaceful time, with love from Wader Quest. © Rick Simpson October 2012. Thanks Nigel, your work is an inspiration to us all. Cheers. Rick and Elis.